( September 2, 2014, New Delhi, Sri Lanka Guardian) Muslims who are over 13.4 % of the population of the country and constitute 73 percent of the minority population (as per 2001 census) are recognised as the most backward among all minorities requiring special attention for their development. The other issues that plague the Muslim community are communal violence coupled with social and systemic exclusion. Hence any holistic approach for a meaningful advancement of Muslims must necessarily include provisions for development; mechanisms to ensure security; and appropriate policy formulations to secure genuine inclusion. In fact in the Indian context, the issues of security and inclusion of Muslims are critical and determine the development trajectory for the community. Prima facie, the trends emerging from the first 100 days of the Modi Government do not appear positive for the Muslim community on any of the essential parameters of security, inclusion or prospects for development. The first major concern of Muslims since the swearing in of the BJP government is the possibility of increased violence against the community. Though the BJP Election Manifesto for 2014 mentions ensuring a peaceful and secure environment, it is clear that a wide range of fringe groups espousing violence and professing allegiance to the Hindutva ideology seem to be striving towards occupation of the centre stage. Incidences of violence started right from the day of counting of votes on 16th May 2014 when two mosques were attacked near Mangalore in Karnataka and continue through attacks on Muslims in Pune, conflicts in Hyderabad, riots in Saharanpur and other incidences of tensions and conflicts in different parts of the country. More than overt violence, it is the series of virulent statements being issued by leaders of different Hindutva groups, including some BJP leaders, and the launch of a systematic campaign around “Love Jihad” and statements like those of BJP MP Yogi Adityanath "If they take one Hindu girl, we will take 100 Muslims girls," are all vitiating the atmosphere like never before to instigate polarisation and could result in outbreak of violence at a large scale. Modi government came to power on the promise of development and jobs for all and any violence adversely impacts the processes of development. Hence it will be in the interest of the government to ensure that there is no violence in the country so that the promise of development and jobs for all is realised and the government can seek a successful re-election in 2019. This would be an ideal scenario and Plan A for the government. If the government is indeed confident and keen about the success of Plan A alone, then it cannot allow any instigation to violence by any one and will be required to take immediate and exemplary action. However, the first 100 days have shown that the government has not taken any strong action or sent a clear message to rein in the fringe Hindutva groups who are consistently vitiating the communal atmosphere in the country. This indicates that preparations for putting in motion Plan B- of coming back to power in 2019 through communal polarisation - seem to have started with all earnestness and may continue to be operative on the fringes and acquire centre stage if and when Plan A appears to be failing. Whether Plan A or Plan B would be a dominant strategy for elections 2019 could become clear by mid 2018. In so far as Muslims are concerned, the issue of security has already come under a cloud during the very first 100 days and the community could face constant threats in the coming years. Given the extent and history of backwardness of Muslims, any meaningful and accelerated development of the community requires the government to first put in place appropriate policies like reservations, special Sub Plans and separate budget statement for expenditure reporting (like it is in the case of Dalits, Tribals and Women) that could eliminate the impediments that cause social and systemic exclusion of the community and only there after any programs and schemes for development could be initiated and implemented effectively. This requires appropriate and effective interventions in the political sphere where most policy decisions are taken. The previous UPA government, with an eye on Muslim votes, had started some initiatives for policy transformations in the field of reservations and Sub Plan but could not operationalise them. 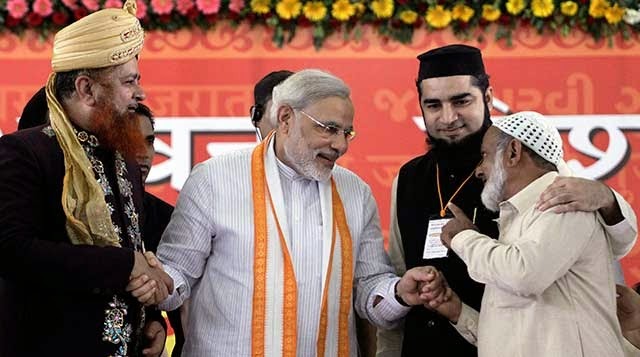 BJP, with a traditional antagonism for the Muslim community and no dependence on the Muslim vote to come to power (as shown in the 2014 General Elections), will not be interested in any such transformational policy initiatives for the Muslim community and it has amply demonstrated this in the Union Budget for 2014 even though the repeated slogan both before and after elections by none less than the Prime Minister is Sab Ka Saath- Sab Ka Vikaas (Every one included- Everyone developed). Another problematic to positive policy formulations for the Muslim community by the BJP led government would be very low participation of Muslims in the ruling BJP at all levels. During 2014 Lok Sabha elections, the party gave tickets to only 7 Muslims out of the 482 candidates it fielded (just 1.45 per cent) and none of its Muslim candidates could win- making it the first time that the ruling party has no Muslim member in the Lok Sabha and only one Muslim as a Minister in the entire Union Government taken from the Rajya Sabha. The fact that BJP did not induct any more Muslims in the government despite having one more senior Muslim member in the Rajya Sabha, even when it gave place to defeated candidates or to those who were not members of either house of Parliament shows that there can be very little representation for Muslims in the present government and in the echelons of policy making. The approach of the government to the policy requirements of the Muslim community can be further gauged from the very first statement of the lone Muslim minister in the Union Cabinet (charged with the Ministry of Minority Affairs) who declared that Muslims are not a minority! The BJP manifesto for 2014 General Elections had promised to give adequate focus on the development of minorities, particularly Muslims but only 0.7 percent of Total Plan Fund of Union Budget 2014-15 has been earmarked for minorities who constitute 19.5% of the population. Only one new scheme under “Up gradation of Traditional Skills in Arts, Resources and Goods” for development of minorities through skill up- gradation has been introduced but there is no fund allocation for 2014-15. Another addition is the allocation of Rs. 100 crore made for Madrasa Modernisation Programme, under the Department of School Education. The total allocation for minorities made in the Interim Budget have been retained and in the Budget Estimate for 2014-15 the allocation for Ministry of Minority Affairs (MoMA) has increased to Rs. 3, 711 crore from Rs. 3, 111 in 2013-14 (Revised Estimate). But records show that there are huge gaps in allocation of resources, utilisation of funds and programme implementation for the development of minorities. The Ministry of Minority Affairs was able to utilize only 78 percent of the total outlay earmarked in the 11thPlan period and actual utilization of the Budget Estimate by the Ministry was as less as 60.41 percent for the year 2012-13 and was at its lowest at only 39.33% in 2007-08. It is clear the inclusion of Minority related programs in the budgetary processes through a separate budget statement in the Union Budget as is already being done in the case of women, children, SCs and STs (for expenditure reporting) will greatly help in a more robust utilization of the budget allotted and facilitate optimal development of the community. But the Budget 2014-15 is totally silent about this and it is uncertain if the present government would undertake the radical policy transformations that the development of minorities would require.